LY2109761 is a novel selective TGF-β receptor type I/II (TβRI/II) dual inhibitor with Ki of 38 nM and 300 nM in a cell-free assay, respectively; shown to negatively affect the phosphorylation of Smad2. C, Western blot analysis of serum cultured GB2 cells treated with each 20 μm inhibitor. The representative Western blot is shown for each protein and the bar charts represent the quantified values (mean ± s.d.) of three replicates. The fold changes were normalized by the relative densities regarding α-Tubulin. Mol Cell Proteomics, 2016, 15(3):1017-31. LY2109761 purchased from Selleck. The expression of p‐AKT after TGFβ1 or LY2109761 treatment on vector‐ and ADAMTS9‐transfected BT549 and SK‐BR‐3 cells. J Cell Mol Med, 2018, 22(2):1257-1271. LY2109761 purchased from Selleck. The inhibition of TGF-β1 signaling pathways suppressed EBV-mediated EMT, and prevented the activation of Syk and Src signaling. The EBV-infected HCECs were treated with 100 nM of the dual TGF-β receptor I and II kinase inhibitor, LY2109761, for 48 hours. The EBV-infected HCECs were cultured with anti-TGF-β1 neutralizing antibody (5 ug/mL) or mouse IgG1 antibody (5 ug/mL) for 48 hours. Photographs were taken at x100 magnification by a digital camera. Invest Ophthalmol Vis Sci 2014 55(3), 1770-9. LY2109761 purchased from Selleck. Toxicology 2014 326C, 9-17. LY2109761 purchased from Selleck. PLoS One 2013 8(12), e83521. LY2109761 purchased from Selleck. Method: Cells are exposed to increasing doses of LY2109761 (~10 μM) for 48 hours. The medium containing drugs is removed, the cells are washed twice with PBS, and fresh medium is added. After 5 days of incubation, the 3-(4,5-dimethylthiazol-2-yl)-2,5-diphenyltetrazolium bromide assay is used to obtain relative variable cell numbers. Administration: Twice a day p.o. Melisi D, et al. Mol Cancer Ther, 2008, 7(4), 829-840. Fransvea E, et al. Hepatology, 2008, 47(5), 1557-1566. Zhang M, et al. Cancer Res, 2011, 71(23), 7155-7167. GW788388 : ALK5-selective, IC50=18 nM. SB525334 : TGFβ receptor I (ALK5), IC50=14.3 nM. 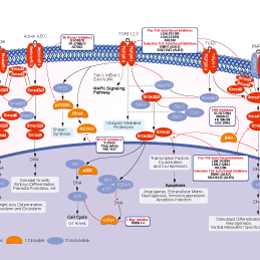 LY2157299 : Phase II for Glioblastoma and Hepatocellular Carcinoma. K02288 New : Potent, and selective type I BMP receptor inhibitor with IC50 of 1.1, 1.8, 6.4 nM for ALK2, ALK1 and ALK6, showing weaker inhibition on other ALKs (3, 4, 5) and ActRIIA. SB431542 is a potent and selective inhibitor of ALK5 with IC50 of 94 nM in a cell-free assay, 100-fold more selective for ALK5 than p38 MAPK and other kinases. LDN-193189 is a selective BMP signaling inhibitor, inhibits the transcriptional activity of the BMP type I receptors ALK2 and ALK3 with IC50 of 5 nM and 30 nM in C2C12 cells, respectively, exhibits 200-fold selectivity for BMP versus TGF-β. 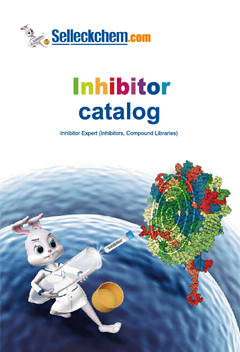 Galunisertib (LY2157299) is a potent TGFβ receptor I (TβRI) inhibitor with IC50 of 56 nM in a cell-free assay. Phase 2/3. SB525334 is a potent and selective inhibitor of TGFβ receptor I (ALK5) with IC50 of 14.3 nM in a cell-free assay, 4-fold less potent to ALK4 than ALK5 and inactive to ALK2, 3, and 6. RepSox is a potent and selective inhibitor of the TGFβR-1/ALK5 with IC50 of 23 nM and 4 nM for ATP binding to ALK5 and ALK5 autophosphorylation in cell-free assays, respectively. Pirfenidone is an inhibitor for TGF-β production and TGF-β stimulated collagen production, reduces production of TNF-α and IL-1β, and also has anti-fibrotic and anti-inflammatory properties. Phase 3. DMH1 is a selective BMP receptor inhibitor with IC50 of 107.9 nM for ALK2, exhibiting no inhibition on AMPK, ALK5, KDR (VEGFR-2) or PDGFR.